It seems that some of the staff at a newly academised primary in the south of Croydon which is now being run by the Harris Federation need to go back to school, after a document outlining the strict new uniform regime was sent out with spelling and English grammar mistakes, including the dreaded grocer’s apostrophe. The story from the first week of term about Harris Primary Academy Kenley –not to be confused with the existing, local authority-run Kenley Primary – has managed to make it into the national press, with The Guardian covering the latest row between Harris and the parents at what was until July known as Roke Primary. Parents last week received a uniform list which included reference to “mohican’s” (used as a plural) and with “pinafore” spelt “pinnafore”. And as is common when a privately run academy takes over and imposes rigid uniform rules, there’s already been some tears before bed-time at the under-new-management Roke, where the vast majority of parents opposed the takeover by Harris, but were ignored by the Department for Education. The Secretary of State for Education is Michael Gove, a known stickler for high standards of English grammar, who has Croydon MP Gavin Barwell as his bag-carrier (or Parliamentary Private Secretary). Parents have returned to the school after the summer break highly suspicious of the new management, and they have not liked what they have encountered. “Parents are complaining of being shouted at to do up top buttons,” one parent told the Guardian. “Kids were outside the school office for wearing summer dresses, which are only allowed in summer term, despite it being the hottest start to September for years. Boys were outside the office for having an elasticated tie rather than a tie-up tie … in year 3. Parents are still seething over a broken promise from Harris over the design of the school’s new badge – again, the majority of Roke parents, and the headteacher at Kenley Primary, had advised against the renaming of the academy-run school using Kenley in its name because of the obvious possibilities for confusion. Over in Carshalton, parents there claim that Harris has broken its promise to them over the design of a school badge at what was previously Camden Juniors. When polled, 98 per cent of parents at Camden Juniors were opposed to the school being handed over to Harris. Perhaps Harris staff have problems understanding numbers as well as spelling and grammar? This entry was posted in Education, Gavin Barwell, Roke Primary, Schools and tagged Carshalton, Croydon, Department for Education, Gavin Barwell, Harris, Harris Federation, Michael Gove. Bookmark the permalink. If the parents don’t like it why don’t they just go on strike? Keep the kids home for a week, make sure the world knows why and see what happens. I doubt even Harris have the brass neck to ignore such an action. We’ve been treated to report after report about this school on Inside Croydon. I sympathise with the parents, who seem to have been ignored left, right and centre. The most sensible suggestion I’ve seen so far is the one above from ndavies144. Sometimes direct action is the only way to make pig-headed people sit up and take notice. And the parents should be telling the Conservative Party that they will be voting otherwise in all future elections until their wishes are given proper consideration. How about founding their own anti-Harris free school? 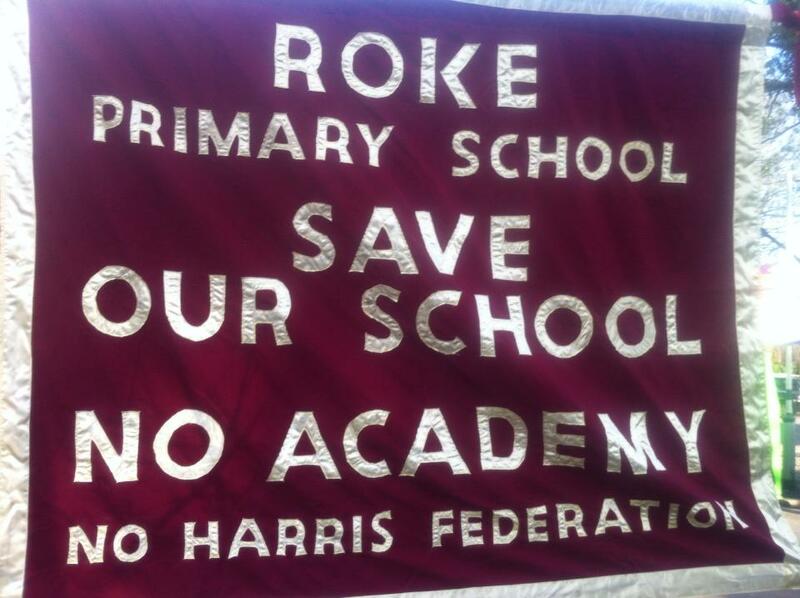 Roke is the fifth primary to be made a Harris academy, and the THIRD against the wishes of parents. DfE’s verified Performance Tables show that the first one, Peckham Park, and the only one with comparative results, went DOWN from 90% SATS English and Maths to 61% after a year of Harris. With a previous year’s SATS of 64%, they had asked to be taken over by Harris, so this appalling deterioration couldn’t be blamed on mass exodus of experienced teachers as at the other schools taken over by Harris. How many other schools are Michael Gove, Lord Nash and DfE compulsorily adding to the Harris collection? As for secondary schools, the same DfE verified results for the last two years showed a larger drop in % passes for 5 A-C GCSE including English/Maths when GCSEs ONLY were counted, not just in Croydon, but at Harris Academies in other boroughs too. And, according to the Telegraph, the % passing the Baccalaureate in 5 good academic subjects was lower at the Harris Academies than most other schools in Croydon. So are the Harris higher GCSE results mostly BTecs in lesser subjects?